The power and impact of an organisation’s culture is often only felt when it is challenged. For example, when you merge two organisations requiring different teams of people to work together, or when you seek to lift business performance with your existing workforce requiring a change in how the work is done. But organisational culture is notoriously difficult to access. One definition states that it is a “set of shared, taken-for-granted implicit assumptions that a group holds and that determines how it perceives, thinks about, and reacts to its various environments.” 1(E. H. Schein – MIT). But if it is something that is “taken for granted”, and “implicit”, then how can we measure and improve it? The first one is “We don’t understand what you are talking about,” “We don’t have the time for this”. The second is “Yes of course – and we do a lot for our employees to motivate them. We conduct yearly employee satisfaction survey and on our website you can find our Company Core Values“. The first group will obviously be conducting business without being conscious of their organisation’s good and bad values and behaviours, which is a business risk – as their aspirations for improved business performance might be blocked by passive resistance that goes unrecognised by the leaders. The second group usually has many good values and behaviours but they might still not be actively connected “to the way we make business and profit” and therefore might be losing business opportunities. The third group however focuses on optimising the business using all means – both hard and soft – to achieve better results, and create long-term higher value for all stakeholders. But if this group of managers demand hard data in order to focus their attention and take action, then what data can be provided? The data-set that OE Cam uses in cultural surveys has been predominantly qualitative, and has been particularly useful for clients at the post-acquisition / pre-integration stage. Through focus groups and interviews, supported by harder follow-up survey data, we get to understand employees’ and leaders’ perceptions of “how things are done around here” commercially, operationally and corporately. In this way, a picture emerges of the similarities, differences and watch-outs that inform the business during integration. In searching to apply these principles in a practical way, it was recognised that the harder operational improvement approaches such as Lean and Six Sigma needed to be connected with the softer culture change approach, and then transferred onto a single Balanced Scorecard of measures that focus on creating lasting change based on both “the way we work” and “the way we behave”. 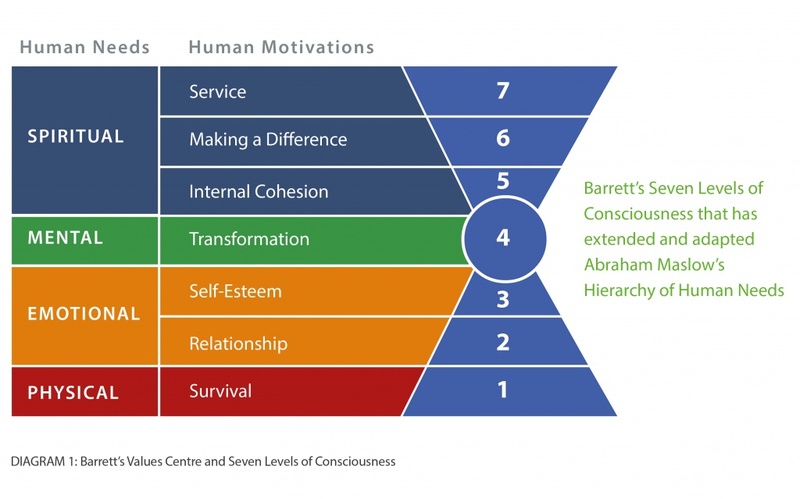 To provide organisational cultural measures and targets it was found that using Barrett’s Values Centre and their Seven Levels of Consciousness model was the most effective. This model, as described in Diagram 1 helps make culture tangible and measurable, and can be aligned to the operational excellence targets, and ultimately measurable performance impact. 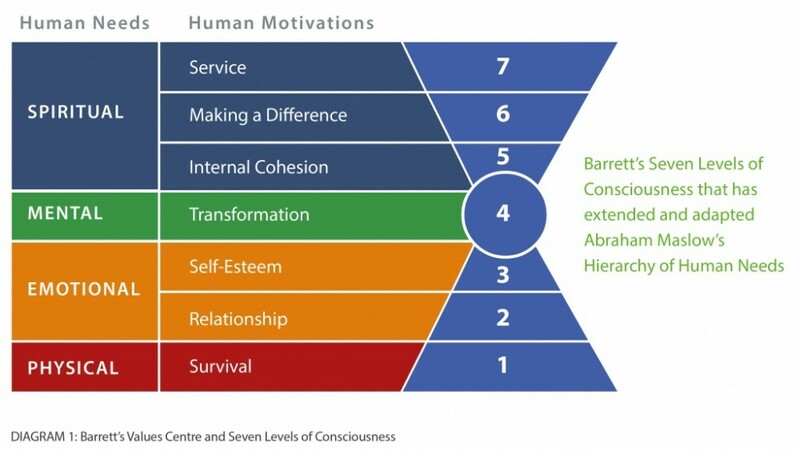 Using this model over the past decade, assessing clients’ employees’ personal values, the leadership’s values, and the corporate values – both actual and desired – has shown big differences between the individual and corporate values, and also between the actual and desired culture. Then, to connect these values and behaviours to operational excellence and the overall strategic direction of an organisation, the scores are built into an adapted version of the Balanced Scorecard. Cultural Entropy – What’s Eating Away at Your Profit? But more powerfully it also has given a clear picture of how healthy a company is by assessing the level of potentially limiting values that exist in an organisation – known as the level of “cultural entropy”. This is the amount of energy in an organisation that is consumed in unproductive work. It is a measure of the conflict, friction and frustration that exists within an organisation. Typically even in well-performing organisations there can be up to 30% of cultural entropy, which indicates that there are significant cultural issues that need addressing before performance can be improved. Just think if you could make a 10-15% improvement and what that could do to your profitability! This measure opens a new world of opportunities for clients – with a measurable bottom-line impact that they might not have seen as possible before. But the measurable impact does not come by assessing the Cultural Values in itself. To achieve an increase in performance, the company also needs to define the company’s aspired values, starting with the leaders of the company all the way through the organisation – and connecting these values with operational excellence. One example of changing values and behaviours that then positively impacted on profitability is with a company in the food production sector. This company is recognised as the best in their industry. However they called ValueCoaching in when they had recognised that the behaviour in the company was not right, with tensions starting to rise amongst their employees. How much of your PRODUCTIVITY is lost due to this limiting value in percentages terms? How much OPPORTUNITY is lost to this limiting value in percentages terms? “We undertook a Cultural Values Assessment, with more than half of the employees participating. And the key finding was that the company had a cultural entropy score of 38%, with the ‘potentially limiting values’ being described as Control – Hard talking – Blame – Silo Mentality – and Job Insecurity”. Our client initially found these results hard to believe, but decided to explore further. So the next exercise was to look at the cultural entropy from a financial point of view by asking the senior managers to decide how much this 38% of cultural entropy actually cost them. Converting these percentages into money, based on the previous year’s financial performance, the company was potentially losing over a million euros. So our focus then turned to understanding the cause of these limiting behaviours and make changes that subsequently would positively impact on their profitability. This was delivered through a development programme in which we developed the strategic initiatives for the following two years, including an initiative for implementing a new core set of values. After only six months the cultural entropy dropped by 10% and then a further 9% during the following year to the present level of 19%, which is within a healthy scale for this kind of business. And these changed behaviours subsequently connected to an increased productivity of around 22% and a profitability increase of 25%. So your smart cultural data-set is one that combines the qualitative, which directs you to the significant cultural issues in your business, with the quantitative, which provides hard monetary value on the limiting values that exist within your organisation’s “set of shared, taken for granted assumptions”. This combined data-set enables you to tackle the hidden resisters of productivity and profitability improvement and can be a most valuable addition to your management information portfolio. Gary leads OE Cam's Organisation Development practice. He consults in the re-design and implementation of organisation structures and management processes, post-merger integration, improvement of joint venture organisation capability, and board and senior management team assessment and development. He has presented at seminars on organisation change, business partnerships, has led a Retail HR Forum, and is a visiting lecturer at the University of Cambridge Institute of Manufacturing.